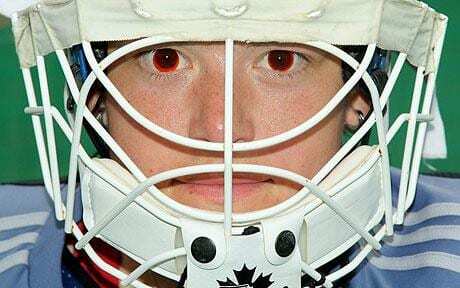 These days at the Beijing Olympics, sportspersons are using red contacts to prevent glare and for increased visibility in the hazy atmosphere. Co-developed by Nike Inc. and Bausch & Lomb over a period of 7 years, these fully tinted lenses — which are now known in the retail world as MaxSight use Light Architecture technology that only allows certain wavelengths of light to pass through the lens and enter the eye. Nike says that this focuses the eyes differently. Details appear more clear and ‘pop’ off the background. They also filter out most harmful blue light and UVA and UVB rays before they reach your pupil. So, it’s almost like wearing sunglasses without wearing sunglasses. While light can leak through sunglasses, through the opening between the frame and the eyes, performance-enhancing contacts sit on the pupils and better protect them from the sun. This helps the eyes relax instead of squinting all the time which in turn relaxes the rest of the body leading to better performance. MaxSight can also delay Pterygium, a condition which causes a callus-type film to form on the cornea, leading to dryness in the eyes of players exposed to too much sunlight. The lens large enough to extend a ring around the iris comes in two colors: amber and grey-green. The amber lens is for fast-moving ball sports, such as tennis, baseball, football or soccer. Grey-green is better for blocking glare for runners or helping a golfer read the contour of the ground. These lenses have a life of about three to four weeks, depending on how often they are worn. Okay that's scary...but I guess if it works then why not? That is totally scary. Interesting though!